One of the most common complaints I hear about Android is that it lacks a desktop interface like iTunes. But in reality, Android devices sync easily to Windows Media Player in much the same way that the iPhone and iPad sync to iTunes, so any Windows user can transfer music between their PC and their Android phone or tablet. Here's how. Unlike the iPhone and iPad, Android devices are designed to be completely self-sufficient. Because they don't rely on desktop synchronization at all, you'd be forgiven for thinking that your Droid doesn't sync with Windows. Of course, Android devices can sync to Windows just as any other media player can. You just need to set up the device correctly first, and then you can drag files around in Windows Media Player and automatically sync media libraries between your phone/tablet and your PC. 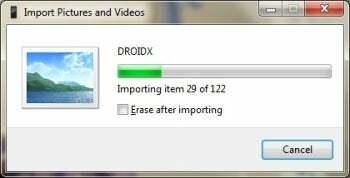 The first time you connect your Android phone to your PC, you'll probably see a little autorun dialog box prompting you to install your phone's drivers or perhaps a small helper app that's preloaded on the phone. This step will vary a bit depending on the phone manufacturer. On my Motorola Droid X, for example, I get a prompt to install a Motorola Helper app. Run the installer, because it'll load all the necessary drivers Windows needs to sync with your device. Be wary of any prompts that try to coerce you into downloading and installing other software from your wireless carrier, such as Verizon's V Cast Media Manager. As a general rule, these apps are terrible. They exist primarily as a way for wireless carriers to squeeze additional revenue from their customers, and they're not necessary to sync your phone to your PC, so just close any browser tabs that pop open with invitations to download this junk. Once you've finished the installation, you should see a control panel window for your device, like the one below. If you don't see it, open the Windows Control Panel, find 'Devices and Printers', and look for a listing for your device. For example, on my system I see an icon that looks exactly like my phone, and it's labeled DROIDX. 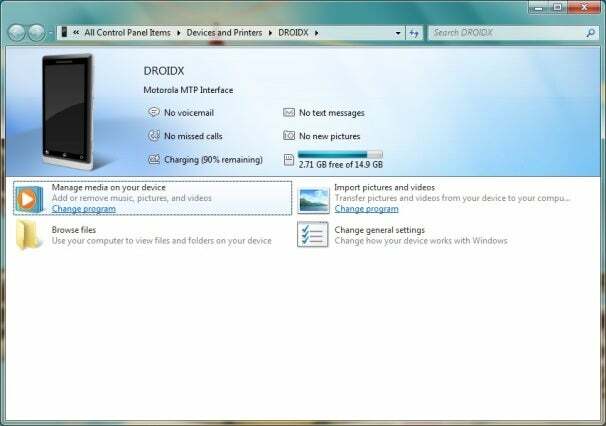 Within the device control panel for your phone, you'll see several options for handling the contents: 'Manage media on your device', 'Import pictures and videos', 'Browse files', and 'Change general settings'. With some devices you may see additional options, but those are the core choices. Windows will automatically choose the default apps for managing music and photos, but you can change them if you want to by clicking Change program under each option. For this tutorial, accept the defaults of Windows Media Player and Windows Live Photo Gallery. You can choose to erase pics and videos from the device automatically after the import, just as on a digital camera. To import videos and pictures you've shot with your phone's camera, double-click Import pictures and videos. Windows will automatically search your phone's camera roll. You can add tags if you wish, and then click OK to start the import. You can check the box to delete the files from your camera, or leave it unchecked to keep them, just as with any digital camera. When all of them are imported, an Explorer window will open to show you what you've transferred. Double-click Manage media on your device to get started syncing media files. If you already have music on your phone that isn't in your Windows music library, you'll want to start by transferring those items from the phone to Windows. To do so, select your device from the list in the left pane, choose Music, and then highlight and drag all of the files into the box marked 'Drag items here'. Click Start sync to transfer them. 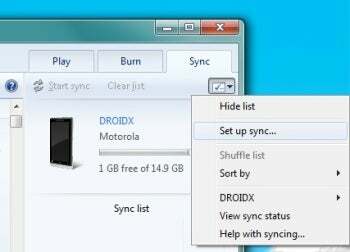 Click 'Set up sync...' to establish a syncing relationship between your Android device and your PC. Once you've moved your music files from the phone to the PC, set up the sync relationship by right-clicking the drop-down menu under the Sync tab on the right side of the window and clicking Set up sync. This action will open a new window, where you may be prompted to choose how Windows Media Player should deal with the data already on your device. To prevent Media Player from wiping anything off your phone's data card, choose the option to leave the data on your device. On the next screen, you'll be asked to name your device; it should already have a name, but you can change it if you prefer. Click Finish to start the sync, which will mirror the media collection on your phone to match your library (as much as your phone's storage capacity will allow). That's it. From this point on, when you connect your phone to your PC, Windows Media Player will look for changes between the library on your phone and its own current collection, and update as needed.